Often after the announcement of CAT/XAT results, MBA aspirants starts getting confused regarding the B-school selection. A lot of data is available about Old IIMs in public domain regarding various parameters like academics, profiles offered etc. But in case of Private B-schools barring MDI, SP Jain, information on all parameters is incomplete. Situation gets even trickier when two similar colleges are compared. Aspirants log on to various MBA related websites, Facebook and Pagalguy group of colleges. These sources can be good for knowledge about institutes but they have a risk of objectivity, MBA websites could have PR generated or paid articles from college. Facebook groups created by student admissions team wouldn’t tell you about negatives of college. 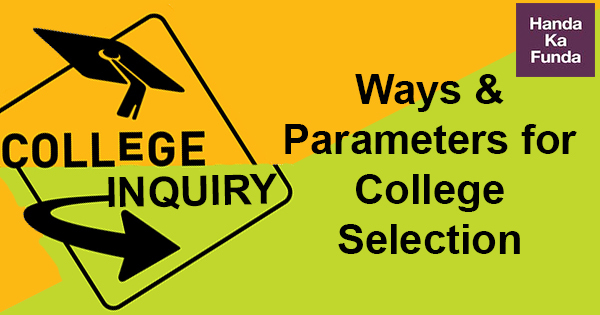 So, what should an aspirant do to find out about the college. Here are a few tips to develop parameters to do so, after all MBA is about frameworks, parameters and analysis. People whom you should talk to The most genuine review of a B-school can give by its students, preferably not from the PR or Admissions committee. To get an objective review, one must talk to multiple people with different background, experience of a fresher would be different in the B-school than that of a person with 4 years of work-ex. A good mix of people to take review should include 1st year, 2nd years students with different specializations, Alumni who have graduated in last 3 years. Above approach would give you a 360-degree feedback. If you can include students with work-ex similar as yours while making inquiries, it would make information more relevant for you as the person you are talking to has the same profile as yours. Tricky part, how to find them? Use social media, after all we live in a connected world. 1. Specialization: Although one needs to choose specialization by end of first year but placement committee would ask you to provide your specialization in 2-3 months for summer placements. You must ask details about specialization, academic rigor that college puts students through, faculty profile, course structure and the method of delivery. Many B-schools have Bloomberg terminals for finance students, simulation software for operations, design thinking workshops etc. which adds real learning value to MBA. Everything in a B-school gets specialization specific, the committees, competitions, placements etc. 2. Placements: For most of the aspirants, it is all about the average package. But they should understand how the average works, some people in a batch would get 21 lpa, many might get 7-8 lpa while average can be 11-12 lpa. So instead of plain average following are the deeper things that you should be looking at- Median salaries offered by companies specialization wise, because batch might have high average due to only good salaries offered to marketing students or finance students. Profiles offered by companies on campus is another criterion to judge placements. Roles like Investment banking, Equity Analysis, Brand Management have a high earning potential. Placements depends upon shortlists a student receives. Companies have their own biases for shortlisting candidates. Just as consulting firms generally prefer candidates with more than 2 years of work-ex, FMCG prefers fresher or candidates with less than 2-years work-ex for their sales roles, Banking firms with functions like Investment Banking prefers candidates with very strong mathematics background and academics. You should always analyze placements of a B-school as per your profile (academic, professional) and the sector you wish to be a part of (if you are clear about it). Batch strength is one of the major constraint that affects placement of a B-school, higher the batch more It is difficult to place. please check about this when you inquire about the college. 3. Corporate Competitions: Companies roll out the case studies as a part of these competitions which are the real problems faced by them; selected candidates who make it to regional or national level gets mentorship from industry stalwarts in form of evaluation, suggestions and sometimes casual meetings; Top 3,5 teams in the competitions gets an opportunity of PPO/PPI and internships along with mind-blowing prize money. But there is a catch here, most of these competitions are restricted to a set of top colleges as per company’s criterion. Mahindra War Room goes to 14 B-school, HUL’s Lime accepts entry from only old IIMs and other top B-schools etc. Roles offered to people converting PPIs of these competitions are usually not offered by these companies on campus easily. E.g. Deloitte gives strategic consulting role to the PPI holders of Deloitte mavericks competition, students from tier 2 B-schools have converted these coveted roles in past which are usually in offered only in old IIMs and other tier 1 B-schools. 4. Alumni Network: Use LinkedIn to search the Alumni network of a B-school. See their career path, roles they have been working in, achievements etc. Search for multiple alumni at different level of work-ex and sectors. It will give a you a fair idea about the B-school. As it is said ‘Alumni’ are the true brand ambassadors of a B-school. 5. Industry Exposure: Theoretical knowledge that one receives while solving case studies in class is static. Guest lectures organized by various committees in college brings corporate stalwarts to campus who gives perspective to current business world and challenges faced by them. Many of the colleges have been able to set up startup incubators in campus with help of VCs and alumni. Many a times student are able to get seed funding through these incubators, if not funding then valuable guidance for sure. Student committees are a very important part of MBA life, events organized by committees helps students apply the theoretical concepts learned into live problems. Limited funding from college, bringing the sponsors on board, attracting crowd from other colleges, branding of the event are the key takeaways from Student committees or ‘coms’ in B-school language. Although this parameter shouldn’t be assigned top priority, it should be used when two B-schools which you have converted are almost on a similar scale as per above parameters. From the above points, it is very fair to conclude that ROI from that you receive from a B-school can’t be mentioned only in terms of average package. Calculation of ROI is specific to an individual’s profile and their expectations from B-school. MBA is most probably the last degree of your career, choose it wisely. You not only invest a hefty amount in term of fee but also 2 years of your life. There are lot of social media forums where aspirants suggest and rate a college, please refrain from doing so as opinion of person with incomplete knowledge is always dangerous. Best of luck.